One of the least expected and most exciting features of Williams’ new Sawyer Library is the Center for Educational Technology, which occupies half of the second floor. The new recording studio is a case in point. Faculty across disciplines will have a sound-controlled space in which to conduct remote telephone interviews or prepare video-based teaching materials and podcasts. Students can film a video for a class project, record a session with their a cappella group or a music audition piece for graduate school applications. 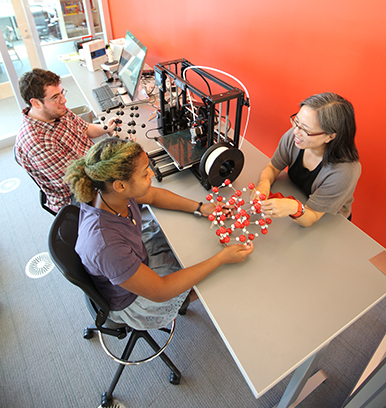 “The collective imagination of our students, faculty, and staff will undoubtedly come up with innumerable creative uses for the space,” says chief technology officer Dinny Taylor. Another CET feature is a videoconference room that supports room-to-room (as opposed to Skype-like person-to-person) visual communication. Special lighting and microphones allow for easily controlled, high-quality audio and visual communication so that entire class groups can gather here to communicate with others across the state or around the world, seeing one another and the lecture materials in each location. There’s one room in the CET that defies easy description. “If I could name it,” says Leamon, “I’d call it the Brainstorming Room.” It has a zero-throw projector, which projects from directly above the screen so that it doesn’t cast a shadow, and multiple white boards on which more than one person can write— and record—ideas at the same time. This room encapsulates CET’s main goal: to support students and faculty in the classroom and beyond, through collaboration and with the use of state-of-the-art technology.